Alderman Lopez has invited the Chicago Department of Public Health to provide no cost flu shots to all 15th Ward and City of Chicago residents. Let's be and stay healthy in 2017! Join 15th Ward Alderman Lopez, staff and residents to learn about available resources and share your thoughts for the future of the 15th Ward. Open to all 15th Ward residents. 15th Ward residents are invited to join Alderman Lopez and representatives from the Cook County Assessor's Office to find out how to save money on their property taxes, know about various property tax exemptions, appealing taxes, and more! Free dog & cat vaccinations, free microchipping, free dog and cat food, pet toy giveaways, health resources, and more! Open to ALL residents. Event is first come, first served up to first 400 pets. Dogs showing signs of respiratory illness will not be serviced. Pets requiring muzzles must be muzzled at the event. Owners must be able to handle their pets around other animals. Special thanks to Rev. Tomasz Sielicki and the Five Holy Martyrs Church for donating their space for this event. Is it time for Harley, Lala or Lassie's rabies shot? 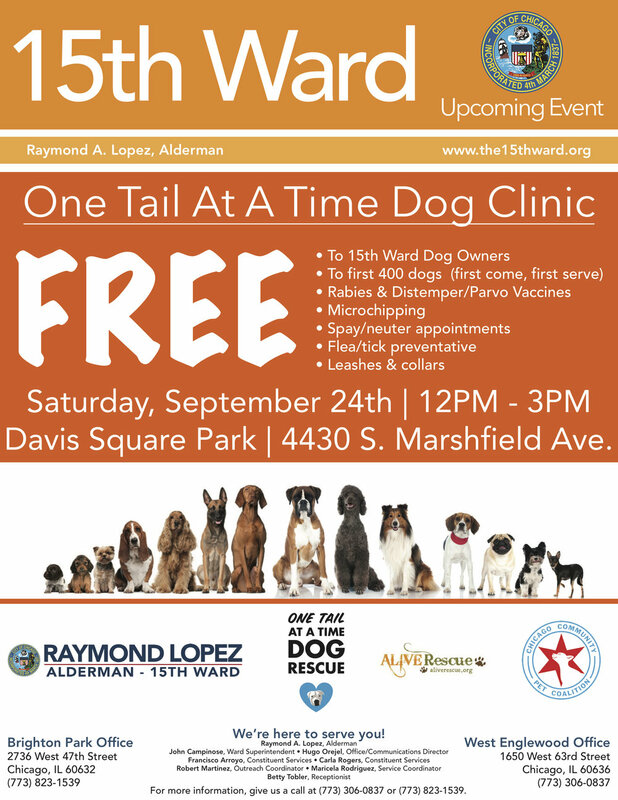 Then be sure to stop by Davis Square Park this Saturday, September 24th for One Tail At A Time's Free 15th Ward Dog Clinic. This event is first come, first serve up to the first 400 dogs. Stop by to have your dog receive their free rabies & distemper/parvo vaccine, free microchipping, schedule their free spay/neuter appointment and learn about flea/tick preventives and more! Special thanks to One Tail At A Time Executive Director Heather Owen for this partnership.